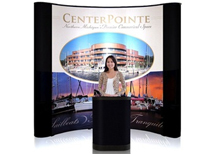 Big Wave 8 foot pop ups are easy to assemble and work great in a 10 foot booth space. The advantage to an 8 foot booth is versatility and flexibility. Although most booth spaces are 10 feet at trade shows, there are some that are only 8 feet wide. Also many companies showcase products or need storage in a booth space so an 8 foot booth offers a smaller footprint allowing for flexibility. The 8 foot kit comes with optional mural graphic panels which cover the entire area of the display. Everything packs into the supplied hard shipping case so it’s easy to take around the country! The Big Wave 8 foot pop up is stocked and ships from CA. 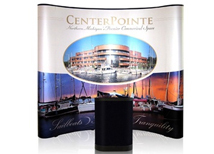 Lead time is only 3 business days for custom printed booths and fabric kits ship same day! The Big Wave uses the popular and common accordion frame with channel bars and panel to create the large backdrop. The kit consists of five panels, three front panels and two end caps. The kit is available with all fabric panels which are Velcro receptive, three front graphic panels with fabric end caps, or all graphic panels. The full mural display is the most popular because it makes a big impact. Full color printing allows for endless design options and color schemes. The 8 foot version of the Big Wave is commonly used by exhibitors with 8 foot booth spaces. Exhibitors also use them in 10 foot booth spaces if extra room is needed in the space. They have also been used as accent walls in large booth spaces like island exhibits. 8 foot displays are also great for marketing events such as conferences or banquets because they take up a minimal amount of space, while making an impact. While the Big Wave is a great option for exhibitors, other trade show booths are available that offer different price points and options. This system is ideal for trade shows and all types of events because it’s easy to set up and transport across the country!